Prepare your grill for direct medium high heat. Mix together the ketchup and mustard in a small bowl. In a separate bowl, mix the sauerkraut with the chopped onion, set aside. Slice open the hot dogs, down the center, lengthwise, forming a deep pocket in each, but not cutting all the way through. Coat the inside of each hot dog with the mustard ketchup mixture. Place a strip of cheese deep within the pocket of each hot dog. Top with sauerkraut and onions. Encapsulate the cheese at the ends with the sauerkraut mixture as well, so that no cheese is exposed (otherwise it will drip out when cooking). 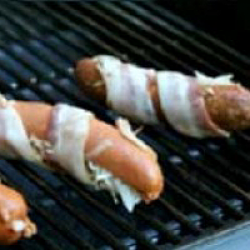 Wrap a strip of bacon around each stuffed hot dog, securing with toothpicks at each end. Make sure you wrap tight enough so that the stuffing stays in, but not so tight so that when the hot dog expands will cooking the bacon would tear. Coat your grill surface with vegetable oil so that the hot dogs don’t stick. If you have a grill screen (a screen with smaller holes so that small pieces of whatever you’re cooking don’t fall through the grill), you can use it, just coat it with vegetable oil first and pre-heat for a couple of minutes. Place the stuffed hot dogs on the grill, stuffing side down. Grill for 2 minutes, until the bacon on that side is cooked, turn the hot dogs a quarter turn and grill for a couple more minutes. Continue to grill for a few minutes each on all sides until the bacon is cooked. Cover the grill in between turnings to help with the cooking. During the last minute of cooking, open up the hot dog buns and place them open-side down on the grill to lightly toast. Remove the hot dogs and buns from the grill. Remove the toothpicks fro the hot dogs, place them in the buns and serve.